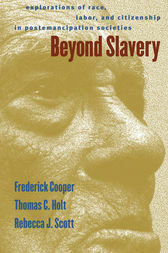 In this collaborative work, three leading historians explore one of the most significant areas of inquiry in modern historiography--the transition from slavery to freedom and what this transition meant for former slaves, former slaveowners, and the societies in which they lived. Their contributions take us beyond the familiar portrait of emancipation as the end of an evil system to consider the questions and the struggles that emerged in freedom's wake. Thomas Holt focuses on emancipation in Jamaica and the contested meaning of citizenship in defining and redefining the concept of freedom; Rebecca Scott investigates the complex struggles and cross-racial alliances that evolved in southern Louisiana and Cuba after the end of slavery; and Frederick Cooper examines the intersection of emancipation and imperialism in French West Africa. In their introduction, the authors address issues of citizenship, labor, and race, in the post-emancipation period and they point the way toward a fuller understanding of the meanings of freedom.